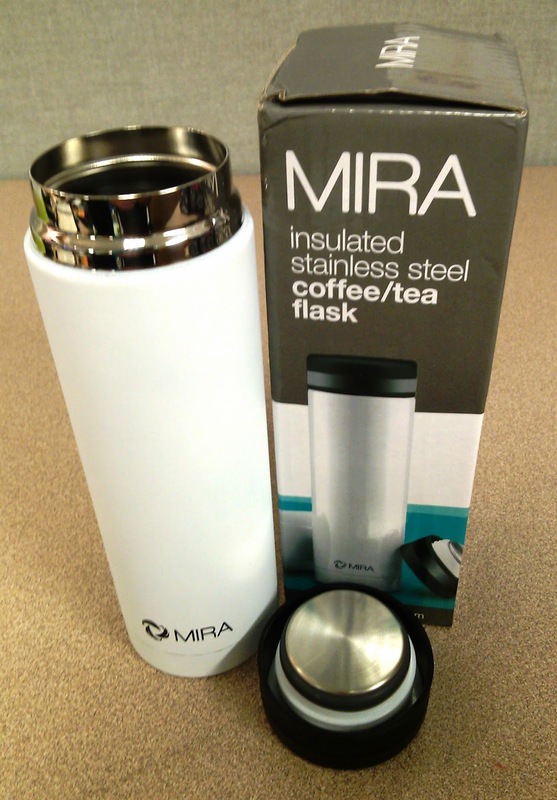 The Insulated Coffee/Tea Flask is a double-wall stainless steel vacuum insulated bottle from MIRA Brands. It is free of BPA and Phthalates and claims to keep drinks cold up to 24 hours and hot up to 12 hours. This bottle is an 11-ounce size, so it's smaller than a normal coffee mug but that makes it great for travel and on-the-go. It has a screw-on cover similar to a thermos, and it doesn't leak at all. The outside of the bottle is a nice white matte finish and doesn't sweat or radiate any heat or cold from inside the bottle so you can have your hand around it even filled with steaming hot liquid. 8 hours - Still Hot! !